Ready for Blender 2.8 beta! Create a jagged extrusion effect that is useful for quickly creating piping, steps, ribbed patterns or more abstract effects. You can also bend and move the extrusion. Works on one or more selected faces. Control the number of steps in the extrusion, the depth and thickness of the cuts to give you a variety of effects. 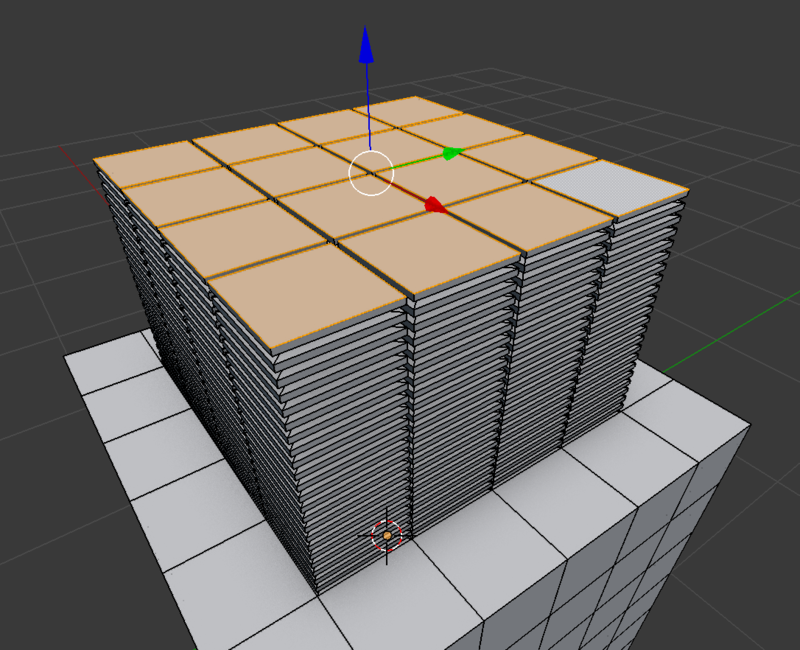 Ability to add some randomness to the step thickness to give varied effects. Taper, transform or rotate the extrusion to give bendable effects - can also be used with the proportional editing tools. Add bevels to the steps to create smoother pipe-like shapes. Can be used on tris, quads or n-gon faces. Choose to extrude selected faces as a region or extrude each selected face individually. Combine with Blender's Path Deform modifier to create intricate piping. If you have any questions or issues with the add-on, don't hesitate to contact me through Blender Market or my Twitter page @markkingsnorth. A file dialogue will pop up. 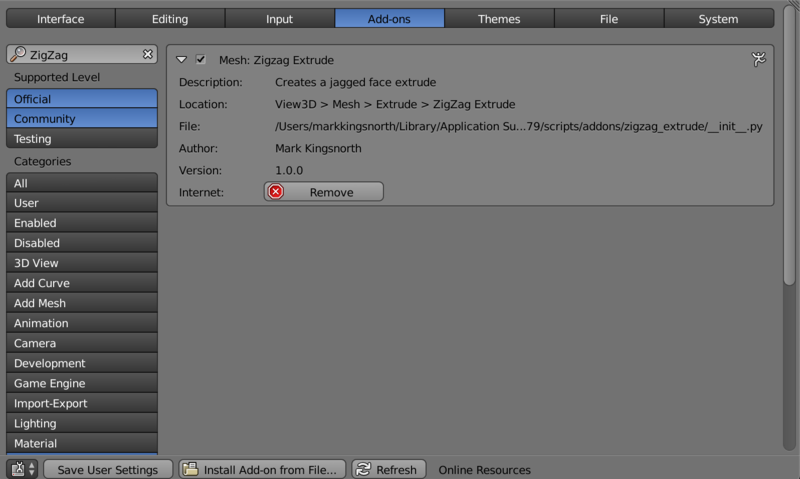 Navigate to the file location where you downloaded the zigzag_extrude.zip file and double click it. Search for the add-on by typing "ZigZag" in the search box if it does not already appear. Make sure the checkbox next to the Add-on (Mesh: Zigzag Extrude) is ticked. Once there you should see folder(s) corresponding to the version(s) you currently have, for instance the 2.79 folder. 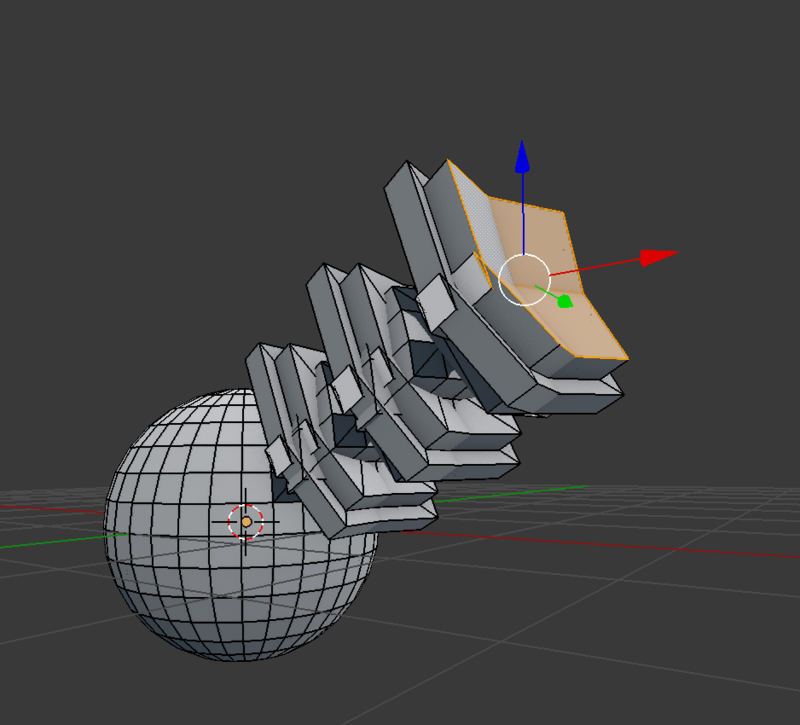 Within that folder, go to scripts/presets/operator/ and create the folder mesh.zigzag_extrude. Unzip the contents of the .zip file to that location. The add-on works by creating customisable insets that creates a jagged effect to an extrusion. You have the following options which allow you to bevel, taper, bend, and move the extrusion effect. The add-on should work on face selections of tris, quads or n-gon faces - basically any type of face you can select in Blender. Select a mesh and go into face edit mode. Select the face(s) you wish to perform a ZigZag extrusion on. 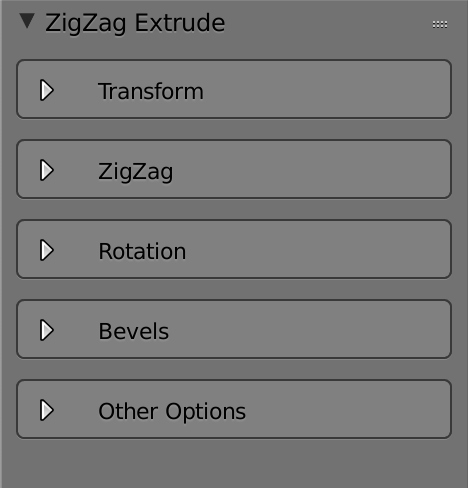 Press the spacebar and start typing 'ZigZag Extrude' to select the menu item. Move the mouse to set the initial extrusion amount. Transform Amount: The amount to move the extruded face by. Orientation: The orientation of the extrusion: Either extrude along the average normal of the selected faces, or along the object's local axis, or by the global orientation. Taper: How tapered to make the overall extrusion. Useful for creating step like effects. Inner Depth: How deep the ZigZag goes. Note - too deep a depth can result in non-manifold geometry. 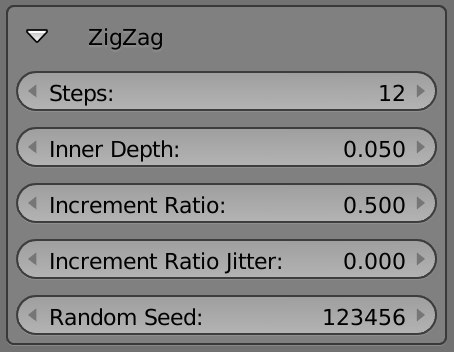 Increment Ratio Jitter: You can add a random variation to the increment ratios to create further interesting effects. A value of 0.0 has no effect. A value of 1.0 creates maximum variation. Random Seed: Change the random seed for the increment ration jitter to change the randomness. You can control the rotation of the extrusion to create a bendable pipe effect. Note that you can alternatively use proportional editing or curve modifiers to create even more intricate effects. 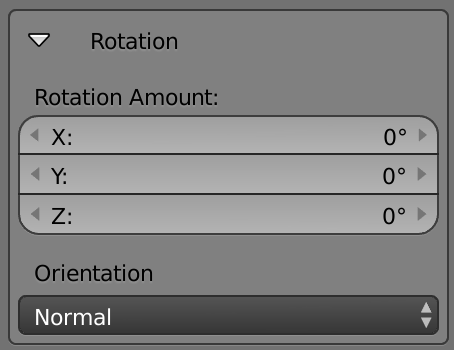 Rotation Amount: The amount of rotation either in the X, Y, or Z axis. Orientation: The direction of the axis for the rotation. By default, the rotation axis is aligned to the average normal of the selected faces. You can alternatively choose Local or Global Orientations. You can add bevel effects to the extrusion, to create pipe-like effects. 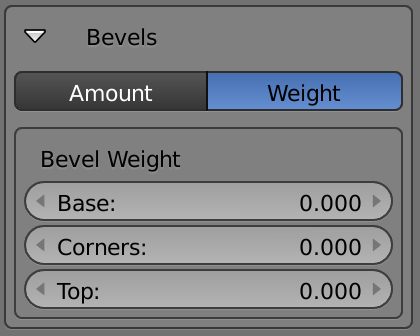 You can control the bevels either by the Amount (which directly changes the mesh) or by Weight (which can be used with the Bevel Modifier to add bevel effects without directly changing the mesh). Inside: Bevel the inside parts of the extrusion. Corners: Bevel the major corners of an extrusion. A corner is defined as when two edges share a face. Outside: Bevel the outside parts of the extrusion. Bevel Segments: The number of segments for each part of the extrusion. Bevel Type: Selects how the values controls the size of the bevel. See the Bevel Documentation for the different options. Inside: For the inside parts of the extrusion. Corners: The major corners of an extrusion. A corner is defined as when two edges share a face. Outside: For the outside parts of the extrusion. X/Z: Increase or decrease the number of extrusion steps. R/F: Change the taper amount. Q/A: Increase/Decrease the outer bevel amount. W/S: Increase/Decrease the corner bevel amount. E/D: Increase/Decrease the inner bevel amount. I would welcome you contacting me through this website or through Twitter for any questions of suggestions you might have. I sometimes get a very malformed set of faces when I use the add-on. What could this be? If parameters like the Inner Depth or Taper are too high, this can cause non-manifold geometry and strange effects. 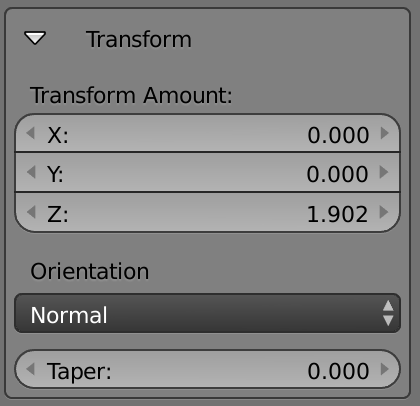 Try reducing parameters like the taper, bevel and inner/outer depth. If you keep having problems, get in touch and I'll see what I can do to help.